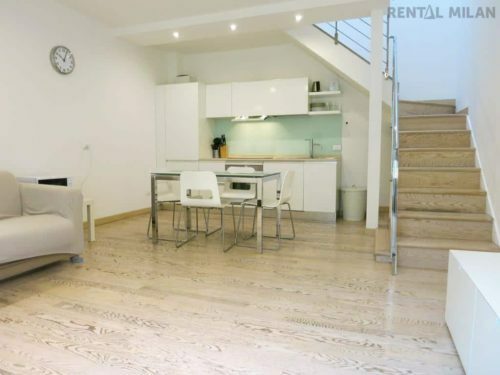 Beautiful 2 bedrooms apartment Milan on 2 floors, with a modern design, renovated, with all the comforts. Perfectly located, in a safe residential area, between Bocconi University and Navigli area. The entrance is from the inner courtyard, where all the windows are facing: it’s very quiet! On the ground floor there are the living room + kitchen, on the 1st floor there are the 2 bedrooms, one with 2 single beds and the other one with a double bed, one bathroom with shower. In each bedroom there is a large wardrobe and a desk. Air conditioning, Wifi, washing machine and dish washer.